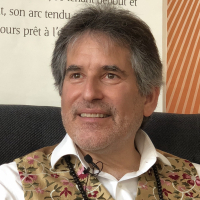 Andrew Cohen is an internationally respected spiritual teacher and the founder of Evolutionary Enlightenment. Raised in a secular Jewish family in New York City, he experienced a spontaneous revelation of cosmic consciousness at the age of sixteen and embarked on a lifelong spiritual journey.Cohen has become known for his willingness to boldly cast aside the sacred cows of the spiritual world. His teaching work grapples with the challenges of bringing the revelation of enlightenment to a contemporary Western audience, integrating postmodern cultural and scientific understanding with an original and sophisticated non-dual philosophy.